Now it is time to show my large projects, those which took me long to finish and that I am really proud of them. I have quite a lot but I will show you only the ones I enjoyed more in stitching. None of them are framed mainly because I don't have space to hang them and like that can be easily stored in a box. If you want to see more of them leave me a comment and I will write a second part with more jobs. 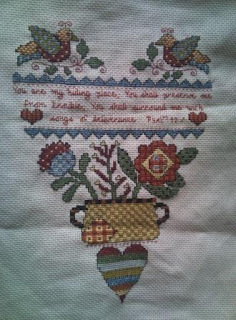 The first large project I did was a sampler organized by Angie from the blog Angie Designer. It came on parts, so it was quite easy to follow. As it was the first it is done in Aida 14 count and it is huge. I would like to repeat it in Aida 18 or 20. This one is a heart in country style made as a present for my mum in the mother's day. 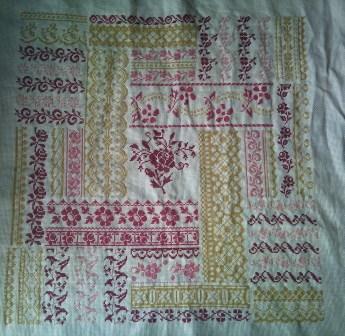 It is very nice and allowed me to know the technique consisting in using two strands of threads in different colours. The effect of that is amazing. I never liked owls too much but my mum loves them. She has a collection of hundreds of owls coming from different part of the world, embroidered owls, soft toys, etc. So as a consequence of doing and buying owls for her I finally also like owls. 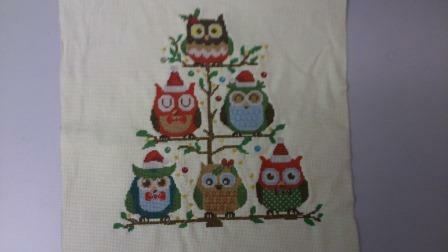 I made this special owl Christmas tree which is quite funny. In this one I need to apologize for the quality of the picture, but I wanted to show you as I like a lot. It shows a house changing during the year. You can see how trees and landscape change with the months. Another sampler, this time in Aida rustic 18 count. It is the famous Dear Jean quilt in cross stitch. It was really nice to embroider. I have few more large project. If you want to see them let me know in the comments and I will do a second post.